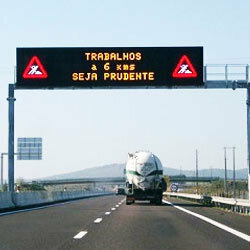 VMS, or Variable Message Signs, are electronic and intelligent display panels for road traffic management. Microtrans offers hi-tech and reliable dynamic messaging solution to the intelligent transportation system. The VMS is fully free programmable can be communicated and controlled locally and remotely. We deals in Moving Message Signs. LED Moving Message Signs are used in any appropriate locations. LED Moving Message Signs are used in any appropriate locations to communicate different kind of messages, from time to time, to many number of people who pass by such area. Variable Message Sign Board (VMS) is the safest and quickest means to notify the road user on real time changes in traffic patterns and road condition. VMS is the LED matrix display, specially designed to display text, graphics, standard road signs, animation, or live video content in monochrome or color. Rajdeep Info Techno Pvt. Ltd.